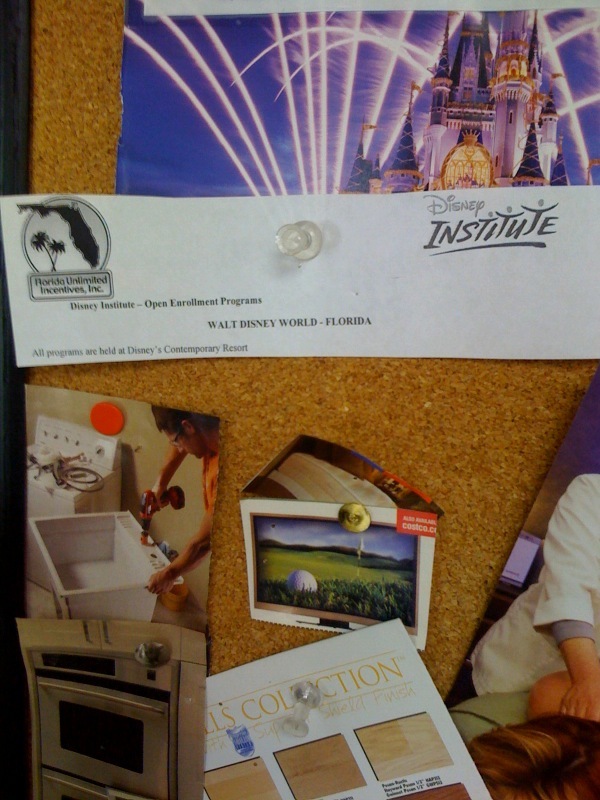 I really wanted to attend a Disney Institute workshop, so I added it to my vision board. Locating the D.I. website was easy enough, deciding on which course was not so easy. My dilemma was two-fold: justifying the cost and which course would have the biggest impact on my business. And then in early 2008 an unexpected email arrived with my silver platter. For the first time ever The Disney Institute was offering a 5-day program with all 5 courses in Orlando. My heart was racing; it was now or never. Could I afford it? Could I leave work, and did my husband have time to go along? Disney designed this one just for me. Well maybe not just for me, but it sure felt like it. Decision made – I was going! I was moving this one to the completed side of my vision board (two years later)! Contributed by: Donna F. (NDGM#14). Donna is our resident (NDGM#14). Donna is our resident Disney Institute expert for small businesses. JL, it’s great to see Donna Flanagin’s post here. Walt Disney was a dreamer and a doer and you are both a chip off the old block, as they say. Aw, thanks Jeff. If I am even a microscopic chip, I would be honored. No matter what, I am having a great time making memories in my life and sometimes in others. Donna, how cool is social media that Walt’s influence is becoming ever greater? Jeff, first I would like to say that I am really honored that you have not only visited but left a comment here. I admire who you are as a person, so I’m tickled that our blog has caught your attention. Secondly, I have been so thrilled since Donna has been contributing as a blogger. Business is certainly an important facet for many leading a Disney Driven Life. She is an asset to our community. Thirdly, I am completely flattered by your compliment in reference to Walt. He was a legend–one that I deeply regret I will never know personally. Donna, I don’t know if you caught it, but we specifically mentioned you and your blogging on Episode 3 of InnerMouse. You can find that episode here if you scroll to the bottom of the screen: http://innermouse.com/blog/ . The episode was on EduMICKation :). Jeff, I couldn’t agree more about your statement here. Social media is one of the most powerful tools of our current society. Disney is beginning to recognize this, and they (as well as his fans) are utilizing it to spread his influence globally. It’s been amazing to even see the growth one year has made in this area. You have to tell me more about the courses, I too have been trying to get to take these course. My company even had them listed through our educational provider Learning Tree and they partnered with Disney to offer those courses, but as I was preparing to sign up they had cut funding to take any courses. I still want to take these courses. Wow, Wow, Wow. The first wow is that you mentioned me. I am so honored. Thank you. The second because I was so shocked that so little is known about the Disney Institute and third because D.I. has a huge untapped market, it appears, of just regular neurotic Disney fans who would love to take their courses. Thank you for mentioning this Episode to me, much appreciated. Donna, Oh I have to tell you, I got the courage to go speak to my head of HR and how I really want to take these courses and she asked a little back ground information and I gave her what I could remember and she said that she felt they would be benefical. I am going to speak to another HR rep. tomorrow about looking at schedule and how soon I can get signed up. 🙂 TY so much for posting this, it just gave me enough courage to go speak to someone about it. Shelley, this has made my day for sure. I will send some “Disney” vibes your way in hopes that this dream comes true for you. You MUST find a way to tell me if you are able to go and let me know what you think. Pixie dust for everyone!!! Donna, I am so disappointed after speaking to my HR team they thought taking the course was a great idea and to get an email to my manager, cc them on it. I did compose an email any really pleaded my case and her response is she knows I “like” Disney and all, but a course in quality service is not needed in my position, so I basically got a BIG fat NO! I tried to explain that is what my job consist of a am the front line for our internal & external customers and I believe this course would be benefical. BUt I am trying to talk to a boss that is not a people person.